The 'Francescana I' is an apartment at the first floor of a portion of the owner's house and it is one of the accommodations f the 'Agriturismo Dea'. Comfortable and well furnished, the apartment is located in a place rich in vegetation, particularly relaxing and far from noisy roads. It is closed to the little medieval castle of Giomici and upon the Chiascio river valley. The site is a good starting point to do tourism and it offers an ideal solution to those that want a relaxing holiday. The Farmhouse Dea takes the name from "Villa Dea", the ancient residence of the Vagni family owner of the farmhouse and of the land cultivated with olive trees, fields and woods. 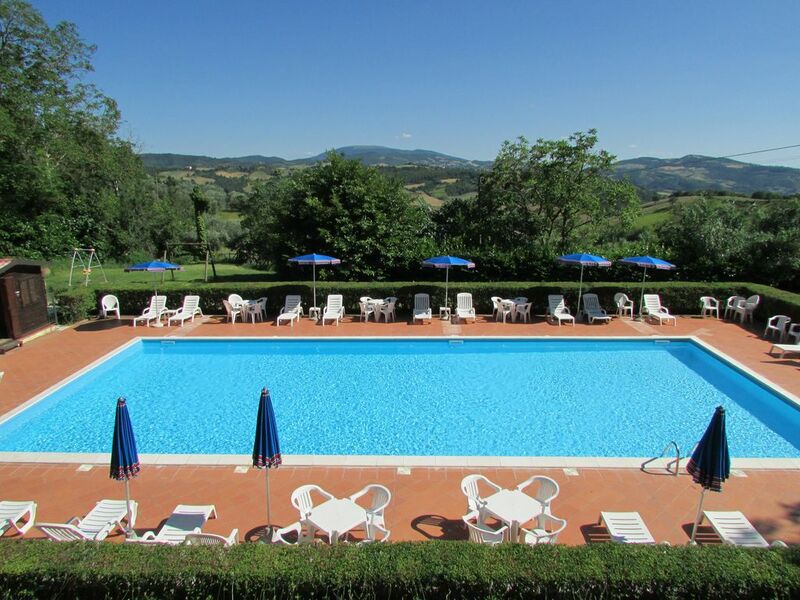 Located near the Giomici castle, in the middle of the area which includes Perugia Assisi and Gubbio, at an altitude of 500m and surrounded by enchanting views, it enjoys the absolute quiet of the environment and offers relaxing stays. The apartments, ample and comfortable, are of different sizes, they have the gardfen and the clients can use the swimming-pool. We are Margherita, Ubaldo and Anna Maria, the Agriturismo Dea's owners. Our family has this property from generations. The first documents that we have are of 1700, when one of our ancestry divided the property with his brother (that remained in the castle) and moved to 'Villa Dea' that was owned by our family. The ancient name of the villa suggested us the agriturismo name. This wonderful place remind to us several reminiscences that we like to share with those that will visit us. This apartment is included in the property that belongs to our family from generations; for us it is full of reminiscences, but those that come for the first time perceive the atmosphere of the ancient family tied with the country and to those places that ooze a feeling of peace and stillness. Those that come at Giomici say that no photos can convey the emotions of this place! The two bathrooms, one with the bath and the other with the shower, have the toilette, the bidet and the washbasin. dining/living-room with a woodden big table. It is possible to switch on the fireplace. 8 m x 18 m. Ample, in the sun, with a beautiful view. It has sun umbrella and beach mattresses. In the loan there is a tennis table and children plays. Our whole family loved our week at Agroturisme Dea. It was traditional and clean. Great location for exploring Perugia, Assisi and Gubbio. The owner Anna and her family were lovely and friendly with plenty of advice if required, and the homemade cookies were a huge hit! The pool was lovely and our daughters loved spending time in it every day. Only downside was limited comfortable space to relax in the apartment for all five of us with only one 2 seater sofa. Thank you very much for your beautiful comment. I'm very pleased that you have spent a nice holiday in our property and your lovely daughters enjoyed the pool. Really there is only one sofa because I think that two of them should take too much room, so we opted for a sofa and two wooden arm chairs, however I can look into an alternative solution. Thank you very much for your suggestion! We spent a nice holiday in very spacious accommodation. Our landlady, Anna, could not have been more helpful. Not only did Anna speak fluent English, but she went out of her way to ensure we enjoyed our holiday. Giving address details and directions to local restaurants and places of interest, providing a hiking map of the local area, as well as accommodating our extremely late arrival time on the first day. The large swimming pool, a 2 minutes walk away from our apartment, was surrounded by lush greenery, providing very calm surroundings. We made frequent use of the tabletennis table near the pool area, for which we had brought our own bats and ball. We had the very large walled sitting area in front of our accommodation, which was overlooked by other apartments, to ourselves. Despite the lack of a view, we enjoyed BBQ’s and al fresco eating, weather permitting. It was a real pleasure to have had Tatjana’s family and that of her sister in low as clients in the Agriturismo. All of them are very friendly and pleasant persons. It was a big satisfaction to see how they appreciated the apartment, the garden and the entire environment; they often went biking or to visit touristic places and for me it was a real pleasure to give them the information to contribute for a beautiful holiday in Umbria. Their barbecue were spectacular! Unluckily the rain of the last crazy summer disturbed their holiday. I will have a nice remember of these persons. E’ stato un vero piace avere avuto la famiglia di Tatjana e quella di sua cognata come ospiti dell’agriturismo. Sono persone molto aperte, cordiali e piacevoli. Era una grande soddisfazione vedere come apprezzassero l’appartamento, il giardino e l’intero contesto; erano in continuo movimento per escursioni in bicicletta o per visitare i luoghi d’interesse turistico e per me era un piacere poter dare loro le indicazioni per vivere al meglio la vacanza in Umbria. I loro barbecue erano uno spettacolo! Purtroppo la pioggia della scorsa estate pazzerella ha disturbato un po’ la vacanza. Porterò con me un bel ricordo di queste persone. Tutto ok, tranne non aver trovato neanche una bottiglia d'acqua arrivando di sera ed essendo il posto lontano dal paese e da negozi x procurarsi il necessario x improvvisare una colazione. Grande chiasso al mattino alle 8 dalla residenza dei proprietari da parte degli addetti alle pulizie e assenza totale di un addetto in piscina. Per il resto posto molto bello, tranquillo, appartamento grande e pulito. Signor Riccardo, non siamo autorizzati al servizio di colazione, potrei mettere negli appartamenti solo cose confezionate, ma in verità non mi sembra carino che in un agriturismo si offrano merendine incellofanate e torte confezionate e non risulta scritto nella descrizione dell’appartamento che i clienti al loro arrivo troveranno il necessario per la prima colazione. Mi sembra veramente strano quanto da lei affermato a riguardo delle pulizie visto che il venerdì mattina non ho pulito nessun appartamento in quanto mi sono concessa qualche ora in più di riposo visto che la sera precedente ho aspettato sveglia fino alle 1 di notte (orario del vostro arrivo), il sabato ho pulito una casa che dista 100 metri dal suo appartamento ed ho iniziato alle 9:30 (dopo la partenza dei clienti). Per le sue dimensioni la piscina non richiede il bagnino, la puliamo tutte le mattine entro le 9:00 ma poi non siamo obbligati ad un controllo costante. Mi dispiace veramente che abbia fatto queste osservazioni, soprattutto in considerazione del fatto che nel salutarci mi ha detto che era stato molto bene. We (3 adults) spent 4 lovely days in Francescana I. The apartment is very classy, clean and comfortable. All supplies are provivded. Moreover, the location of the apartment, close to a castle, is spectacular. Anna-Maria is very kind and helpful. All in all, a great place to stay if you would like to discover beautiful Umbria. Nous avons passé un très agréable séjour dans le grand appartement Lucertola, très propre et très calme. Nous recommandons ces gîtes sans aucun doute! merci beaucoup pour votre recension! Il a été un vrai plaisir de vous avoir eu chez nous, votre famille et votre amis êtes très jolies et fort plaisants. Je suis très content que vous avez passé une bonne vacance. Merci beaucoup encore! -PERUGIA(30 km) rich on Etruscan finds and Medieval buildings, we suggest the visit the 'IV Novembre' Squire ( where there is the Great Fountain and the Cathedral), the Priori Palace, the Notari Room, the Art Museum, the 'Collegio del Cambio' , the Matteotti Squire (where there is the Ancient University Palace and the 'Capitano del Popolo' Palace), the 'Maestà delle Volte' Street, the Etruscan Arch, the Etruscan Well, the 'Rocca Paolina', The 'San Bernardino' and 'San Pietro' Churches and, 'San Domenico' Church (where there is the Archaeological Museum with numerous important Etruscan finds like the 'Cippo Perugino' and the 'Cai Cutu family's grave'). During the year many shows are organized. -ASSISI(28 km) with Saint Frances Basilica, Saint Frances street, the 'S. Rufino' 'S. Chiara' and 'S.Pietro' churches, 'S. Damiano' monastery, the 'Carceri' hermitage. Not far from Assisi there is the 'Santa Maria degli Angeli' basilica built on the place where Saint Frances died. -GUBBIO(30km) with the splendid 'Consoli' Palace, the 'Signoria' squire, the Roman Theatre, the 'Ducal Palace'. 6 km far from the apartment, at Valfabbrica village, it is possible to find every important service (grocer's shop, baker's shop, chemist's shop, doctor, post office, bank, police) and a tennis court in synthetic grass. 35 km far it is possible to do horse riding in the woods, paths in the Monte Cucco Park, spelunking, rafting, free fly.